Anchorage, Alaska—A coalition of animal welfare and conservation organizations launched a two-week advertising campaign today on Alaska Dispatch News to coincide with the Conference on Global Leadership in the Arctic: Cooperation, Innovation, Engagement and Resilience (GLACIER). The State Department–sponsored conference in Anchorage will highlight domestic and international priorities in the Arctic. The conference brings together foreign ministers of Arctic nations and key non-Arctic states with scientists, policymakers, and stakeholders from Alaska and the Arctic. In light of the recent passage of the vessel Winter Bay through Russia’s Northern Sea Route (NSR), the organizations are calling on GLACIER delegates and President Obama—who will attend the conference—to ensure that an increasingly ice-free Arctic will not become a thoroughfare for trade in commercial whale products. The Winter Bay, chartered by notorious Icelandic whaler Kristján Loftsson, departed Iceland on June 4 carrying an estimated 1,800 metric tons of endangered fin whale products; the vessel docked in Osaka, Japan on August 30. Although initially scheduled to transit African ports, the ship obtained a permit on May 25 from Russia’s NSR Authority for passage through the Arctic, despite being a single-hulled vessel with only minimal ice strengthening. Iceland’s President, Ólafur Ragnar Grímsson, has been an ardent proponent of opening northern waters to increased shipping, calling for the Arctic to become the Suez Canal of the north. Loftsson, when asked about the Winter Bay, indicated that he had been inspired to send the vessel via the NSR after attending Grímsson’s Arctic Circle meetings. "Fin whales continue to be slaughtered and shipped from Iceland to Japan, undermining the moratorium on commercial whaling and ban on international commercial trade in fin whale products,” said Amy Zets, Environmental Investigation Agency (EIA) policy analyst. “Shipping through the Arctic shouldn't facilitate trafficking in endangered wildlife—it's already dangerous enough." "The continued slaughter of endangered fin whales and other cetaceans essential for sustainable marine ecosystems represents a shameful deficit in Icelandic government's regulations in the face of such blatant short-term profiteering to the detriment of the long-term future of fish stocks and the marine environment so essential to the nation,” said Paul Thompson, director of the CarbonFix Foundation. The organizations also contend that delegates at GLACIER should consider how increased commercial shipping through the Arctic could encourage a greater flow of trade in endangered whale products from commercial whaling. 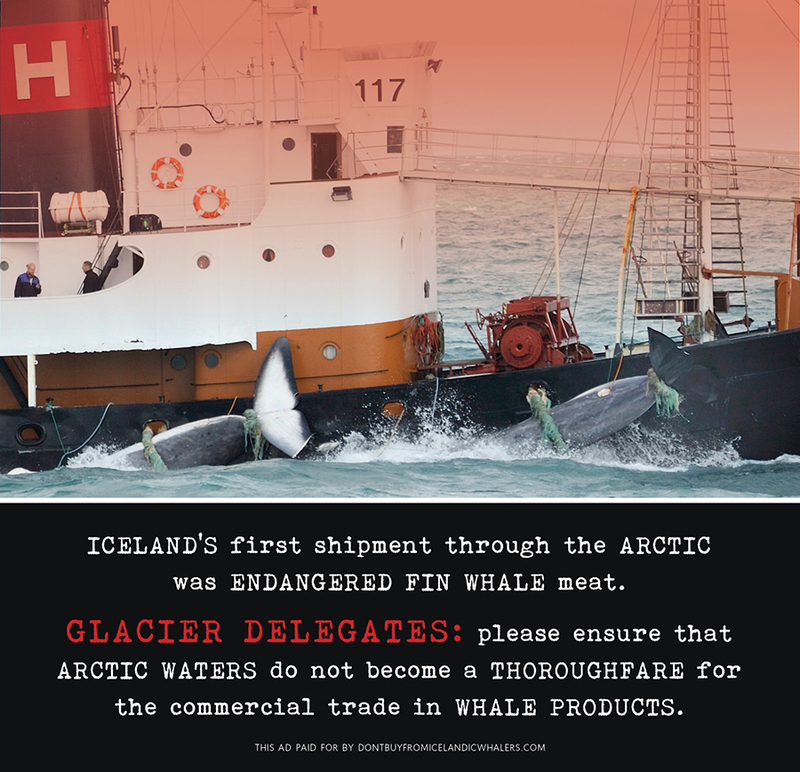 “GLACIER delegates should avoid throwing a commercial lifeline to Iceland's whale hunters. Allowing the Arctic to be used as a whaler highway to Japanese markets makes everyone complicit in the slaughter,” said Taryn Kiekow Heimer, senior policy analyst at the Natural Resources Defense Council (NRDC). Funding for the advertisement campaign is provided by AWI, CarbonFix Foundation, Cetacean Society International, EIA, Nantucket Marine Mammal Conservation Program, NRDC, Oceancare, WDC, Whale and Dolphin Conservation, and the Whaleman Foundation. To view the advertisement featured in the organization’s campaign, visit http://awionline.org/sites/default/files/uploads/images/AWI-ML-AlaskaDispatchAd-Web.jpg.